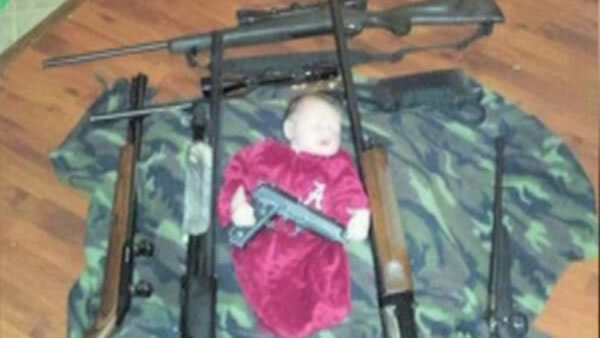 An Alabama shooting range is getting just what it wanted when it posted a controversial picture of a baby on its Facebook page. MONTGOMERY, Ala. -- An Alabama shooting range is getting just what it wanted when it posted a controversial picture of a baby on its Facebook page. The photo shows an infant lying down with a handgun across its stomach, surrounded by rifles. The owners say they don't endorse the picture but hoped it would get people talking. "Primarily here at Montgomery Indoor Shooting Complex, we promote firearm safety, so in order to stimulate a little dialogue we put a controversial picture in effort to get people's feedback and get some awareness about that topic," Montgomery Indoor Shooting Complex's Lilly Ann Gibbs said. Reaction, as you can imagine, was immediate. Many called the photo inappropriate and outrageous. Others didn't see anything wrong, saying as long as the guns weren't loaded it was no big deal. The shooting range has now taken the picture down but not after inciting some conversation and getting a lot of free publicity.